Distribution: The pumpkinseed is native to the upper Mississippi, Great Lakes, and east coast drainages from New Brunswick south to South Carolina. Description: Pumpkinseeds may be distinguished from other sunfish by a red spot on the rear margin of the operculum, just above the pectoral fin. The pectoral fins are long and pointed and the caudal fin is forked. Adult pumpkinseeds are often striking in color with a dark green back, rust colored spots, and a bright orange belly. There are bluish green streaks on the head radiating out from the mouth and eye. The orange spot on the operculum distinguishes the pumpkinseed from other sunfish, although the spot may not always be present on juvenile fish. Habitat: Pumpkinseed sunfish, also known as common sunfish, are an adaptable species capable of living in both lacustrine and riverine habitats. They are usually found associated with aquatic vegetation along the shorelines of lakes and ponds. In rivers and streams pumpkinseeds usually inhabit backwaters and deeper pools with little current, although they may be found in faster moving water if there are slower flowing reaches near by. Life History: Pumpkinseed males excavate a circular nest in shallow water, often in groups or colonies. Females spawn with males in multiple nests where the eggs are aggressively defended by the males until they hatch. Pumpkinseeds feed on invertebrates attached to plants or on the bottom. Its jaws are adapted for crushing the shells of snails and other hard-shelled prey. Conservation/Management: Pumpkinseeds are widespread and abundant throughout the state. They are New Hampshire's most common native sunfish. 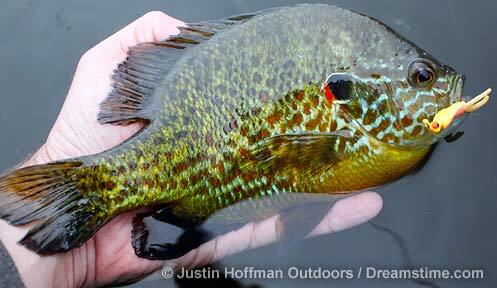 Pumpkinseeds are a good tasting panfish. Easily caught in shallow water using small lures or live bait, they make a good introduction to fishing for young children. Protecting natural vegetation along the shorelines of lakes and ponds is critical for maintaining healthy populations of pumpkinseeds and other warmwater fish species.